The megacities of Android: Netrunner teem with hundreds of thousands of people whose lives and careers have been ruined by the game’s megacorporations and their legal teams. Legal actions and corporate mergers ensure the megacorps face limited competition, and it’s not uncommon for these megalithic giants of industry to buy competitors’ ideas simply to bury them. What happens to such buried technology? Sometimes, an enterprising individual, such as Kati Jones ( Humanity’s Shadow , 91), may attempt to repurpose it through avenues outside of the law. The pilot Kati Jones had just launched her express courier service when Haas-Bioroid sued her parents for copyright infringement on an android AI design they had built over a decade of hard work. Her parents were completely out-lawyered during the bitter, high-profile case, but the leading manufacturer of bioroids went above and beyond to discredit her parents’ design. Working with NBN’s media segments, Haas-Bioroid portrayed Kati’s parents as greedy upstarts and even implicated Kati and her siblings, falsifying a DUI incident that grounded Kati for a year when she lost her pilot’s license. Of course, without her pilot’s license, her courier business tanked. However, Kati’s story didn’t end there. Unlike hundreds of others trampled into the mud by corporate schemes, Kati found a way to fight back. Reaching out to other inventors, engineers, and entrepreneurs who had been similarly deprived of their livelihoods, Kati forged a number of profitable connections and reinvented herself in the shadows of corporate progress as a smuggler and black marketeer. Now, Kati Jones offers her services as a courier of illicit merchandise to those individuals, like Runners, whose activities sometimes stray outside the standard, legal avenues of business. 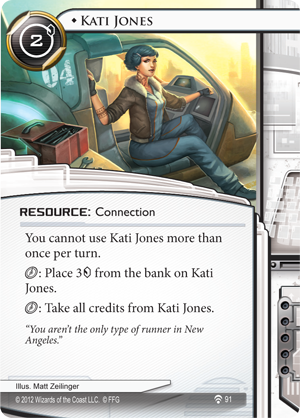 Kati Jones is just one of several unique thieves and corporate talents to appear in Humanity’s Shadow . 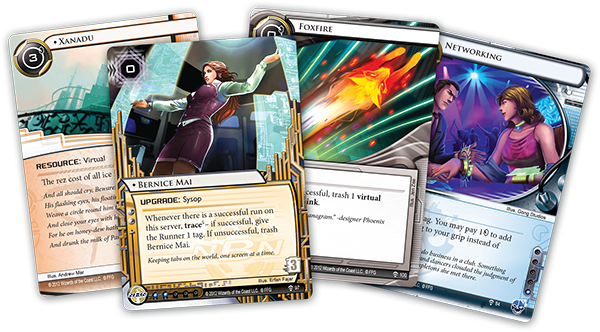 Along with new hardware, programs, and events, the fifth Data Pack in the Genesis Cycle presents some of the talented individuals who put these tools to good use.